Home » Product Information » Why Copper Chimney Caps? A beautifully designed home is desired by most, and the pride of the one who is blessed enough to own one. Perfectly manicured lawn, exquisite décor add an overall flow to the home where one thing compliments the next brings a sense of accomplishment and ownership to the homeowner. When an odd and out-of-place appliance fills in a space within a home, it can mess with the overall look and feel that the homeowner might be trying to create. Though the appliances might be needed in order to maintain the functionality of the home, it may stick out like a sore thumb. Thankfully, in today’s world where looks and outward appeal are very important, most manufactures that work with residential housing know how to create attractive, fully functional necessities that some home owners need such as a chimney cap. A chimney cap is very important feature to some homeowners. Over the years, manufacturers have worked hard at improving the look and shape of chimney caps to be more attractive to home buyers without reducing the quality of the chimney cap. A chimney cap can be designed and constructed with various forms of metals. Depending on the homes geographical location, the type of metal used to construct the chimney cap may vary. For example, if a person lives near salt water the chimney cap they may choose would differ from a homeowner that lives up north where it snows eight out of twelve months. 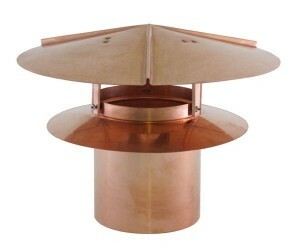 Upgrading to a copper chimney cap is growing in popularity as a result of their durability. Upgraded copper vents add a fantastic look to the home exterior décor, the copper chimney cap has proven to be weather resistant and do not easily crack or become rusty over time. Companies, such as FAMCO, understand that a copper chimney cap can take away from your homes outside appeal, so FAMCO has strived to provide several copper chimney cap options to their clients in hopes of satisfying their client’s taste. If you are new to the topic of chimney caps, flue’s and chimney pots, you might not understand what is so great about a copper chimney cap. A chimney cap plays a vital role in the overall wellbeing of the fireplace, flue and room ventilation. A chimney cap monitors the air flow in and out of the home. It prevents smoke from be down drafted once it has made its way up the flue. A chimney cap also protects from weather and other elements such as bats, birds and squirrels. By choosing a copper chimney cap, the heat and moisture that is trapped will not have the opportunity to sit and corrode the copper chimney cap. For a unique and attractive touch to your home, consider upgrading to a copper chimney cap.